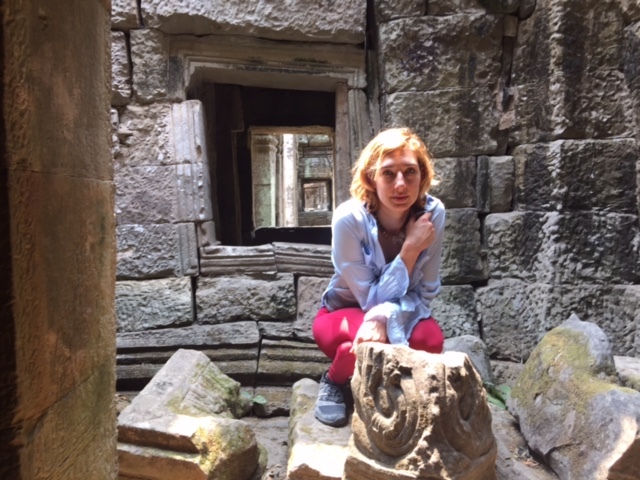 If you travel to Angkor you will most likely see 3-4 Temples. Angkor Wat is the most famous of the temples, but there is so much beauty and history at each temple. You cannot just see the most popular one. 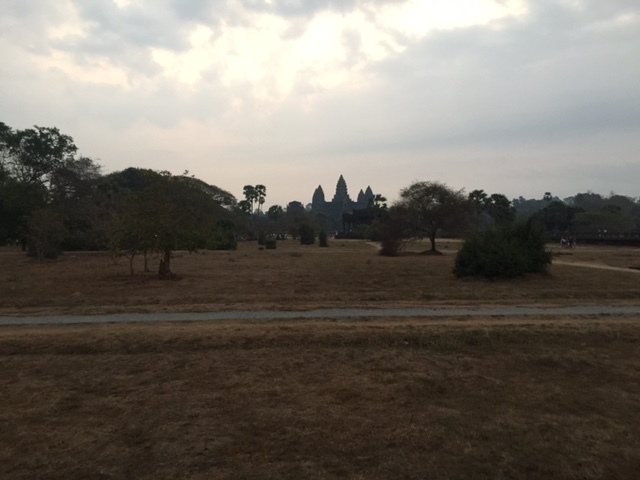 As Brad will share with you, we started the day with sunrise at Angkor. Then we were off on a trek through the jungle. Our guide Stèphane, was more than just a tour guide. He, in fact, has more knowledge and heart for these historical and religious spaces than most of the locals. After walking along an 8 meter high wall and then through the jungle listening to cicadas and in search of other unique insects and wildlife, we came across some local cows. I, of course, fell in love with them. The pictures our photographer Ana has of me and the cows will be posted in the blog next week. For now here’s one Brad took of me. 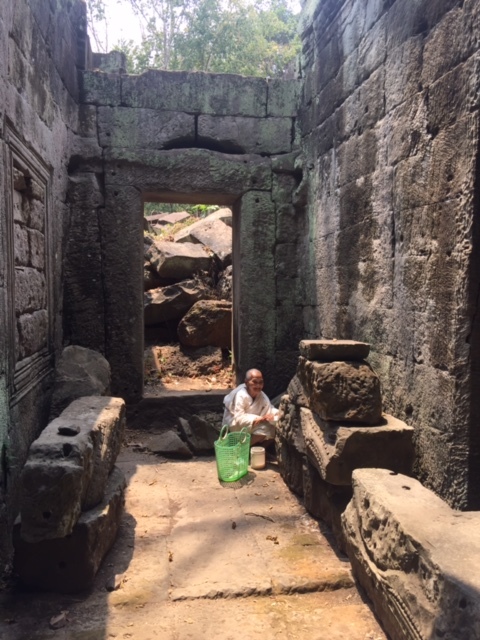 After another hour of walking and learning how essential termites are to this jungle, we arrived at the temple called Preah Kahn. 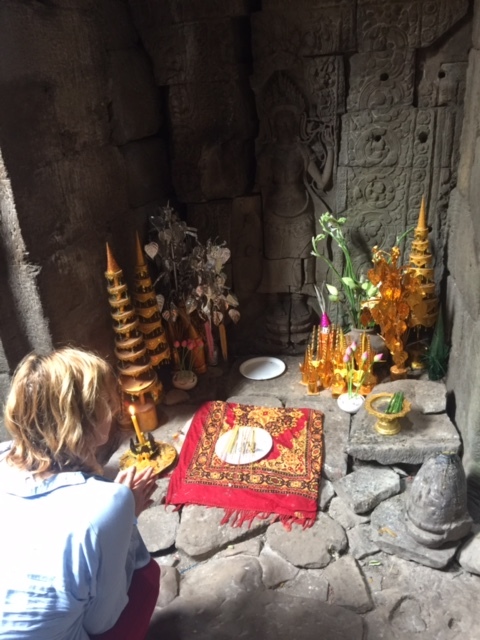 As we walked around this beautiful space and took in just what exactly was around us, Stephane found a guard who assured him that this woman who takes care of the Temple and gives blessings was there. I wish I could describe how wonderful this moment was. Already our day had included multiple temples and tons of history lessons, bugs, animals and a wonderful feeling of being so present – even while experiencing the beauty of the past. Then, to have the opportunity to meet this old woman and receive a blessing from her is a gift I will never forget. Her love and respect for this space is beyond words. She is 78 years old and in this country she has seen things none of us in the States will ever experience. Yet, she smiles and she prays. She was so happy to see our guide. His blessing was definitely longer than ours! Brad filmed ours so stay tuned for posting of that! Afterwards, it was off through the jungle. More incredibleness to see. 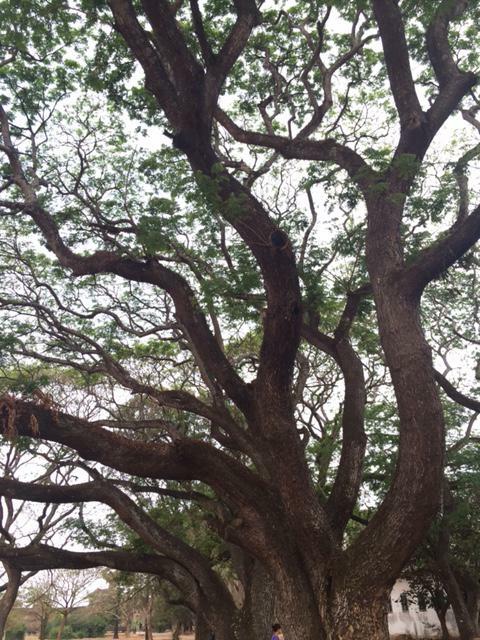 If you’re wanting more info on the temples for sure check out Brad’s post but also, come visit! 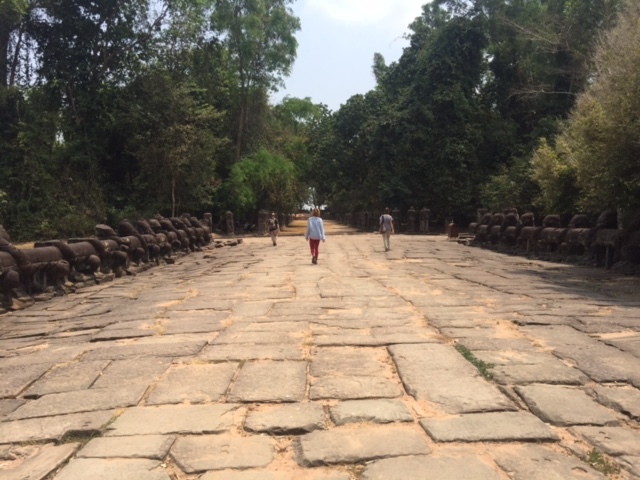 Seriously, get yourself out to Siem Reap, to Angkor. Don’t just hire some random tour company. There are more than 4 Temples. Get off the beaten path and learn the real history. After lunch and another couple temples we finished at Baray (temple of 4 faces). Most people come here and go straight up to the top. But with so many carvings telling the history of the times and about 50 towers with 4 faces each, there is much more to see. There was a time when Angkor was the Center the Universe. This Temple has a center. It’s center is the literal center of Angkor. When you kneel at this tower you find your self kneeling at the Center of the Universe. There are no words for how humbling this is. After 11 hours of Temples and over 30k counted steps, we called it a day. We sat at the moat to Angkor and enjoyed a cold beverage. When we first had landed here in Siem Reap, something pulled on our heart strings. Something about this place calls to us. We shall return sooner than you would think. Please message us if you want info on travel to Siem Reap. While not experts (yet) we have important information, Tuk-Tuk drivers and guides you should use. Yes, we have a personal Tuk-Tuk driver here.